This flexible, hands-free phone and tablet holder gives you screen access at a healthier angle wherever you need it while freeing up your hands, too. Bend the holder to stand on surfaces like a desk or countertop, or wrap or hang it on your body for sitting on the couch, in bed, or use on-the-go. Dimensions: 25" x 10" x 0.5"
I was looking for domething different and found it! This was a gift for my brother in law and he seems to really like it. I love my ipad stand. I have arthritis in my hands so it sure helps by holding the ipad for me. For all the times you wished you had an extra hand, this hands-free phone and tablet holder lends you one. 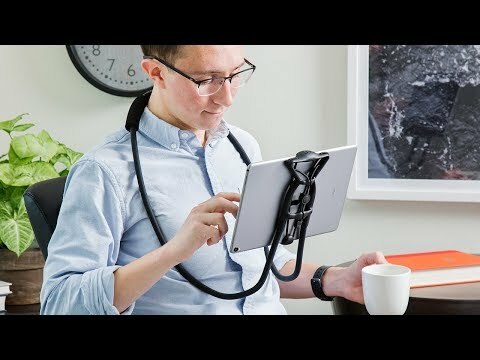 It suspends (hence the name) from your body and holds your device exactly where you want it, whether you’re on the couch, in bed, or even standing or walking. It’s easier on your hands and neck, too, because you can view the screen at a healthier angle. The flexible arm is the key to Sospendo’s versatility. Wrap it around you—from your neck, or around your waist—or bend it into a stand to sit on a desk or countertop. 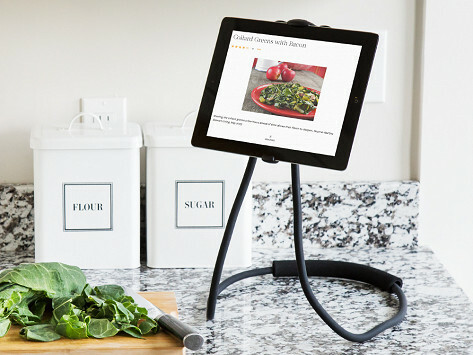 It can hold your device vertically or horizontally, and is great for things like hands-free video calls or hands-on cooking and recipe-following. We also like the idea of using it to watch movies in the car (as a passenger only, please!) or on a plane. And because you can get the perfect viewing position, there’s no more tired arms or kinks in your neck.